What your teacher never told you.. Why Columbus sailed west! Columbus, Christopher (1451-1506), Italian Spanish navigator who sailed west across the Atlantic Ocean in search of a route to Asia but achieved fame by making landfall in the Americas instead. On October 12, 1492, two worlds unknown to each other met for the first time on a small island in the Caribbean Sea . While on a voyage for Spain in search of a direct sea route from Europe to Asia, Christopher Columbus unintentionally discovered the Americas. However, in four separate voyages to the Caribbean from 1492 to 1504, he remained convinced that he had found the lands that Marco Polo reached in his overland travels to China at the end of the 13th century. To Columbus it was only a matter of time before a passage was found through the Caribbean islands to the fabled cities of Asia. Columbus was not the first European to reach the Americas—Vikings from Scandinavia had briefly settled on the North American coast, in what is now Newfoundland and Labrador, Canada, in the late 10th or early 11th century. However, Columbus’s explorations had a profound impact on the world. They led directly to the opening of the western hemisphere to European colonization; to large-scale exchanges of plants, animals, cultures, and ideas between the two worlds; and, on a darker note, to the deaths of millions of indigenous American peoples from war, forced labor, and disease. Understanding Christopher Columbus is difficult without understanding the world into which he was born. The 15th century was a century of change, and many events that occurred during that time profoundly affected European society. Many of these events were driven by the centuries-long conflict between Christians and Muslims, followers of the religion known as Islam. The event that had the most far-reaching effects on Europe in the 15th century was the fall of the city of Constantinople (modern Istanbul, Turkey) to the Muslim Ottoman Empire. Constantinople had been the capital of the Orthodox Christian Byzantine Empire for centuries, and it was an important center for trade between Europe and Asia. In 1453 the Ottoman Empire, which had already conquered much of southeastern Europe, captured the city, closing an important trade route from Europe to the east (see Ottoman Empire). European merchants could still buy Asian goods from Muslims in places such as Alexandria, Egypt. However, Europeans longed for a sea route to Asia that would allow them to bypass the Muslims and purchase Asian products directly. In addition, European princes and kings quickly realized that the first nation to find such a route could become very wealthy by monopolizing the highly profitable Asian trade. The first European nation to begin actively seeking a sea route to Asia was Portugal. The Portuguese had already begun exploring Africa in the early 1400s, and in 1415 they invaded northern Africa and conquered the Muslim commercial center of Ceuta on the Strait of Gibraltar. This gained the Portuguese access to the lucrative African trade, which, until that time, had been dominated by the Muslims. Under the tutelage of Prince Henry the Navigator, who established a school for navigators in southern Portugal shortly after the Ceuta invasion, the Portuguese began exploring the western coast of Africa, hoping to find a route to the riches of Asia by going around the southern tip of the continent. Other nations, not wanting to be left behind, began sponsoring voyages of exploration as well. Into this world, full of the excitement of exploration and discovery, Christopher Columbus was born. Biographical facts on Columbus vary from author to author. However, most scholars generally agree that he was born in the Italian port city of Genoa, on the Ligurian Sea (an arm of the Mediterranean Sea), between August 25 and October 31, 1451. His name in Italian was Cristoforo Colombo, which is translated into English as Christopher Columbus, into Spanish as Cristóbal Colón, and into Portuguese as Christovão Colom. Columbus used the Portuguese version of his name while in Portugal and the Spanish version after moving to Spain in 1485. Columbus’s father was Domenico Colombo, a wool weaver who was also involved in local politics. His mother was Suzanna Fontanarossa, the daughter of a wool weaver. The eldest of five children, Christopher had three brothers—Bartholomew, Giovanni Pellegrino, and Giacomo—and one sister, Bianchinetta. The entire family moved to the nearby port city of Savona, west of Genoa, in 1470. Although how much formal education Columbus received as a child is not known, the schools of Italian craft guilds (which Columbus, as the son of a wool weaver, would have attended) did offer a rudimentary level of reading and writing. As a boy, Christopher joined his father in the family business of wool processing and selling. He may have worked as a clerk in a Genoese bookshop as well. However, as did many other young men who grew up in a major seaport, Columbus soon began a life of seafaring. Beginning his seagoing career at age 14, Columbus served on various ships in various roles, including messenger, common sailor, and, perhaps, even as a 21-year-old privateer. Columbus’s son Ferdinand stated in History of the Life and Deeds of Christopher Columbus that in 1472 Columbus was given command of a ship on a privateering expedition to Tunis in northern Africa. In a lost letter, Columbus supposedly related to his son how René I, duke of the French province of Anjou, had commissioned Columbus to make a surprise attack on a large Spanish ship sailing off the coast of North Africa. Most historians doubt, however, that Columbus ever received command of the expedition. Much more credible, though, is a subsequent expedition. In 1474 Columbus was hired as a sailor on a ship bound for the island of Khíos in the Aegean Sea, an arm of the eastern Mediterranean Sea. This was his first long voyage and must have proved profitable, because after spending a year on the island he was able to become economically independent from his family. This voyage also represents a great irony in the life of Columbus—the trip to this small island in the Aegean brought him the closest he would ever get to Asia. On August 13, 1476, a Genoese commercial expedition of five ships bound for England gave Columbus his first opportunity to leave the Mediterranean Sea and sail into the Atlantic Ocean. But it was an inauspicious beginning for Columbus: According to tradition, the entire fleet was attacked by French privateers off Cape Saint Vincent on the southwestern tip of Portugal. Both sides lost ships; Columbus, one of the unfortunate ones whose ship was burned, had no escape other than to swim for the Portuguese coast. He made it the 10 km (6 mi) to shore by clinging to wreckage. After regaining his strength in the port of Lagos, Columbus made his way to Lisbon and its large community of Genoese merchants and shipbuilders. He was 25 years old. By 1477 Columbus was settled in Lisbon. Since the beginning of Portuguese voyages of exploration in the middle of the 14th century, Lisbon had become a haven for explorers, adventurers, entrepreneurs, merchants, and any others who saw their fortunes tied to the trade winds and ocean currents. Columbus’s brother Bartholomew worked in Lisbon as a mapmaker, and for a time the brothers worked together as draftsmen and book collectors. Later that year, Columbus set sail on a convoy loaded with goods to be sold in northern Atlantic ports. In 1478 or 1479 Columbus met and married Felipa Perestrello e Moniz, the daughter of a respected, though relatively poor, noble family. Felipa’s father, Bartolomeo Perestrello, who was already deceased when Columbus met Felipa, had served as governor of Porto Santo in the Madeira Islands, a Portuguese possession off the northwest coast of Africa. 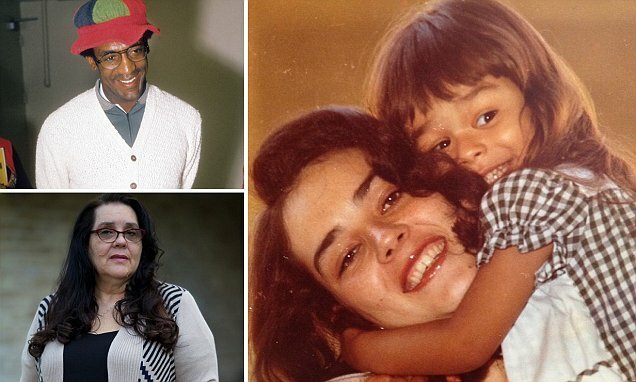 Soon after their marriage, the newlyweds accompanied the rest of the family back to Porto Santo, where Felipa’s oldest brother took over the governorship. Columbus and Felipa moved to the larger island of Madeira in 1480 or 1481, soon after their son Diego was born. It is believed that Felipa died soon thereafter. In late 1481 or early 1482 Columbus sailed to the Portuguese fortress of Elmina, in what is now Ghana, on the western coast of Africa. Columbus was impressed with the riches Africa offered, especially gold. In addition, like all good navigators, he was eager to learn about winds and ocean currents from the local pilots and sailors. In the waters off the coast of Africa and the nearby Canary Islands Columbus first observed the ocean phenomenon known as the Canaries Current (see Atlantic Ocean: Currents). Knowledge of this fast-moving current running west of the Canary Islands could well have been the reason that Columbus later chose to start his crossing of the Atlantic in the latitude of the Canaries, far south of Spain or Portugal. The experiences of these years led directly to the genesis of Columbus’s plan to reach the east by going west, what he called his “Enterprise of the Indies.” (To Europeans in Columbus’s day, all lands to the east of the Indus River in Asia were “the Indies.”) Inspiration and assistance for his plan came from a number of sources. First, his marriage into the Portuguese nobility proved helpful because, although relatively poor, the family still had connections to the Portuguese court. Columbus apparently gained access to his father-in-law’s papers and found a wealth of information, including maps, charts revealing ocean currents, interviews with sailors, and stories about objects that had drifted to the coast of the Madeira Islands from the west. Still another group is looking for Mt. Ararat, where the Bible says Noah landed after the flood. This group is looking to confirm the tradition thatnearby Mt. Cudi (Judi Dagh) is really Mt. Ararat, as recorded in the Quran, Sura 11.44. They have not uncovered much scientific evidence to date, but they do have an intriguing Assyrian relief, which may explain why a local tradition regards Mt. Cudi as Mt. Ararat. Is there any connection between Mt. Cudi and the Genesis flood account—a complex narrative in the Hebrew Bible? In his new book The Ark before Noah: Decoding the Story of the Flood, Irving Finkel of the British Museum discusses three mountains that have flood stories affiliated with them: Mt. Ararat (Agri Dagh), Mt. Cudi and Mt. Nisir (Pir Omar Gudrun), where the ark rested according to the Gilgamesh Epic. Famous TV Star Comes Out - Bill Cosby Raped her too! The deceased man the FBI is investigating in the D.B. Cooper case was a surveyor whose training might have enabled him to scout locations to parachute from the skyjacked Boeing 727. Lynn Doyle Cooper, who has been linked by his niece to the 1971 skyjacking, worked as an engineering surveyor, according to an Oregon death certificate. His brother, Dewey Max Cooper, who also has been implicated by the niece in the skyjacking, once worked at Boeing, his former sister-in-law, Grace Hailey, said Thursday. He also is deceased, Hailey said. Hailey, 67, who lives in Oklahoma, said she did not know precisely when Dewey Cooper worked at Boeing, but that it was roughly during the same period as the hijacking. A person by that name worked briefly for Boeing in the late 1960s, a Boeing spokesman said Thursday, but no other information was available. It's not known if his job would have given him knowledge of the skyjacked airplane. Hailey's daughter, Marla Cooper, in television interviews on Wednesday said she believes her two uncles were involved in the fabled skyjacking on Thanksgiving Eve 1971. The FBI said earlier this week that it had been investigating a "promising lead" for more than a year and confirmed that Marla Cooper, who lives in Oklahoma City, had provided information. The bureau also said it was working with the family to obtain items from which fingerprints might be lifted to compare to partial prints obtained from the Boeing jet. The skyjacker parachuted from the Northwest Orient Airlines plane with $200,000 in cash paid by the airline as ransom money. It remains the nation's only unsolved skyjacking. George Zimmerman: Prelude to a shooting-The REAL STORY! DEVELOPING – A grand jury in St. Louis County on Monday declined to indict the Ferguson police officer who shot and killed an unarmed black teenager in August in a case that touched off nationwide protests and cries of police brutality. St. Louis County Prosecuting Attorney Bob McCulloch announced the decision not to indict Darren Wilson on Monday evening. A grand jury of nine whites and three blacks had been meeting weekly since Aug. 20 to consider evidence in the fatal shooting of Michael Brown, 18. The panel met for 70 hours and heard from 60 witnesses. McCulloch stressed that the grand jurors were "the only people who heard every witness ... and every piece of evidence." He said many witness presented conflicting statements that ultimately were inconsistent with the physical evidence. What Is the Temple Mount, and Why Is There So Much Fighting Around It? The Temple Mount has been the focus of a surge in deadly violence in recent weeks, with Israelis and Palestinians casting blame on one another for fueling the unrest that has gripped Jerusalem, the city holy to the world’s three major monotheistic religions. The renewed conflict has raised some important questions: Why is the site so significant, why has it been a flashpoint for violence, and what impact could it have on the prospects for peace in the volatile region? The Temple Mount is the holiest site in Judaism. The earliest association with the site’s holiness can be found in Genesis 22, when Abraham nearly sacrifices his son Isaac at God’s command. Genesis 22:2 refers to the site being in the area of Mount Moriah. Later, when the Jews built the First Temple and then the Second Temple, they chose to build there as the place God had spoken to Abraham. The site also housed the Holy of Holies, where the Ark of the Covenant stood as the earthly home for the divine presence. There is an incredible message in the story of Naaman for God's people, a message most of God's people miss which may be costing them their health and their faith. Naaman was struck with a skin disease. So he packed up some riches as payment and went to seek healing from the king of Israel. Of course the king could not do that so the prophet Elisha came to the rescue.But Naaman already had his mind made up of how he would be healed. "Elisha sent a messenger to say to him, “Go, wash yourself seven times in the Jordan, and your flesh will be restored and you will be cleansed. But Naaman went away angry and said, “I thought that he would surely come out to me and stand and call on the name of the Lord his God, wave his hand over the spot and cure me of my leprosy. Are not Abana and Pharpar, the rivers of Damascus, better than all the waters of Israel? Couldn’t I wash in them and be cleansed?” So he turned and went off in a rage." Naaman almost missed his chance to be healed because it didn't match up with the way he thought it should be done. He thought if he wasn't instantly healed by the prophet waving his hands over him, then at least it should be in a better river than the Jordan. But reluctantly, Naaman obeyed (in part due to the promptings of his servants) and followed the unconventional way of healing as he was directed. And because of that, his faith in God was restored along with his health. "Now I know that there is no God in all the world except in Israel." God did not need a "cleaner" river like Naaman thought in order to heal him. 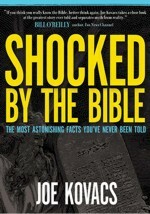 Was it possible that God used such an unconventional way of healing Naaman in order to see where his faith really was? And if so, is it possible that God still does that today? Could it be that if we already have decided in our mind how God will heal us that God might call us to a different, maybe unconventional, way in order to simply bless us with increased faith as well? Eternal burning hell? How merciful is your God? Our Future Is Not Very Brite! 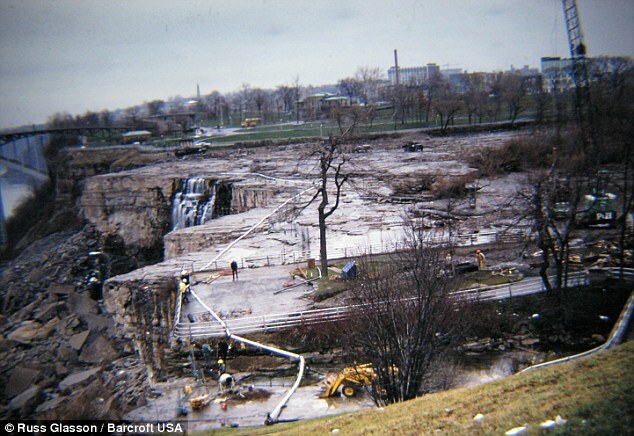 It's taken 41 years, but a previously unseen set of photos of the mighty Niagara Falls reduced to nothing more than a barren cliff-top have finally surfaced. The stark images reveal North America's iconic - and most powerful - waterfall to be almost as dry as a desert. In June 1969, U.S. engineers diverted the flow of the Niagara River away from the American side of the falls for several months. Their plan was to remove the large amount of loose rock from the base of the waterfall, an idea which they eventually abandoned due to expense in November of that year. During the interim, they studied the riverbed and mechanically bolted and strengthened a number of faults to delay the gradual erosion of the American Falls. 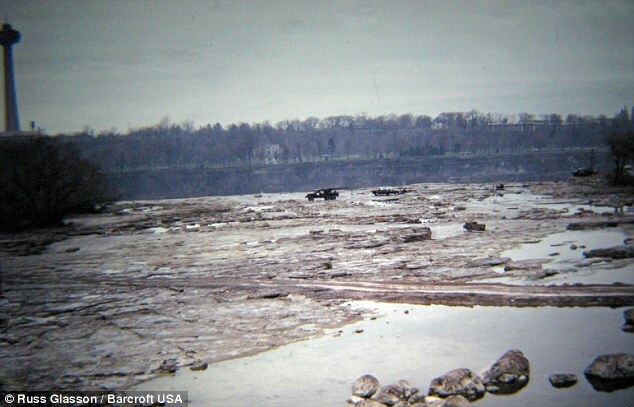 The team, made up of U.S. Army Corp of Engineers, blew up their temporary dam in November 1969 and six million cubic feet of water once again thundered over the falls' sides every minute. 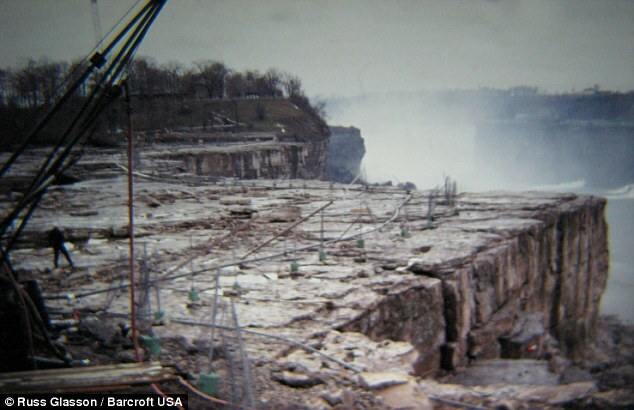 Now, after lying unseen for more than four decades, a set of images showing the eerie calm at the American Falls that year have been unearthed by a man from Connecticut. Russ Glasson recently stumbled across the pictures, which were taken by his in-laws, and had been left in an old shoebox in their garage for over four decades. Two rockslides from the plate of the falls in 1931 and 1954 had caused a large amount of rock to be collected at the base. 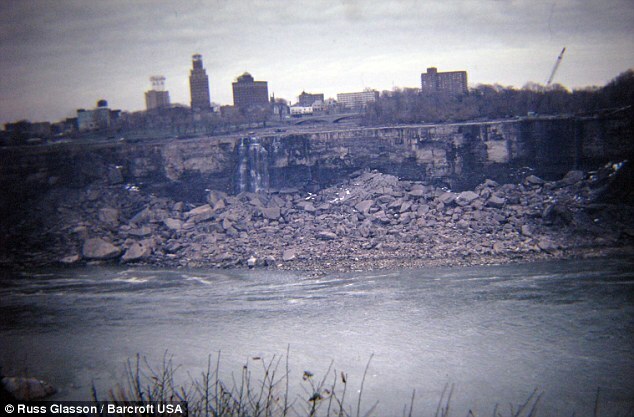 In 1965, reporters at local newspaper Niagara Falls Gazette revealed that the America Falls would eventually cease to flow and stop altogether if the rocks were not removed. Four years later, the U.S. Army Corp of Engineers were charged with de-watering the falls to clean the river bed and to remove any loose rock at the bottom of the falls. Reverend Billy Graham, arguably the most well-known and respected evangelical preacher of the last 50 years, said in a recently published commentary that America was “founded by men who believed in prayer” and that prayer can turn “the tide of history,” adding that while “America is just as wicked as Sodom and Gomorrah” and deserves “the judgment of God,” this judgment can be lessened through prayer. “Even though America is just as wicked as Sodom and Gomorrah ever were, and as deserving of the judgment of God, God would spare us if we were earnestly praying, with hearts that had been cleansed and washed by the blood of Christ,” said Rev. Graham in his commentary for Decisionmagazine, published by the Billy Graham Evangelistic Association. Which laws has God 'written on our hearts'? Ebola: Is it one of the seven last plagues? The World Health Organization recently reported that the current outbreak of Ebola in West Africa, (first cases notified in March 2014), is the largest and most complex Ebola outbreak since the Ebola virus was first discovered in 1976. There have been more cases and deaths in this outbreak than all others combined. The WHO's Global Polio "Emergency"
Was their action of taking arms against their own government justified, or where they actually criminals that should have been arrested and imprisoned or executed for treason. And if the latter is the opinion of the official's writing the response, should we nullify the Declaration of Independence and declare the United States as a criminal government. If, as I expect, virtually no one takes this position, that the USA is an illegal criminal government, then they should have to address the items in the Declaration as how they apply today to the laws that they are passing and why Americans would not have the right to take arms against them! After all, those colonialist who signed the Declaration, declared it LAWFUL TO KILL THEIR OWN COUNTRYMEN in what was actually our first Civil War! What will it take for it to be legal for AMERICANS TO TAKE ARMS against their own Government? A new German documentary claims to lift the lid on the real reason behind the infamous Roswell UFO conspiracy. It's nearly 70 years since the bizarre incident first captured the imagination of conspiracy theorists the world over. The once sleepy New Mexico town became the focal point of the biggest extraterrestrial hunt in history following reports a flying saucer had crashed into the desert. In 1947, the alleged sightings sparked worldwide panic until the US military claimed the incident was nothing more than a downed surveillance balloon. Now a German documentary investigating the sightings on July 8, 1947 claims it has uncovered new evidence, claiming the mysterious flying saucer was in fact a top secret Nazi ROCKET. The feature, entitled 'UFOs and the Third Reich', reports the 'incident' was actually behind closed doors tests on the 'Bell' - a futuristic three-metre aircraft which used electric particles to fly. Reagan responds to Obama and his supporters - and to Republicans who forget!